The employee card is the employee's identification card in the organization. This card is used for managing and defining the employee's details and authorizations as well as managing the relationship and agreements between the organization and the employee. Personal Details - The general information and personal details of the employee. This is the primary tab of the employee card. Employment Details - This tab displays employment details and includes the working hours, Extra hours definitions, Shifts layout and Irregular shifts. Authorization - The Hyper authorizations of the user. Attendance - Display and update the attendance of the employee, according to the user's authorizations. Commissions - Update and display the commissions of the selected employee. Login / Out log - Display the login and logout times of the user, for the selected dates. 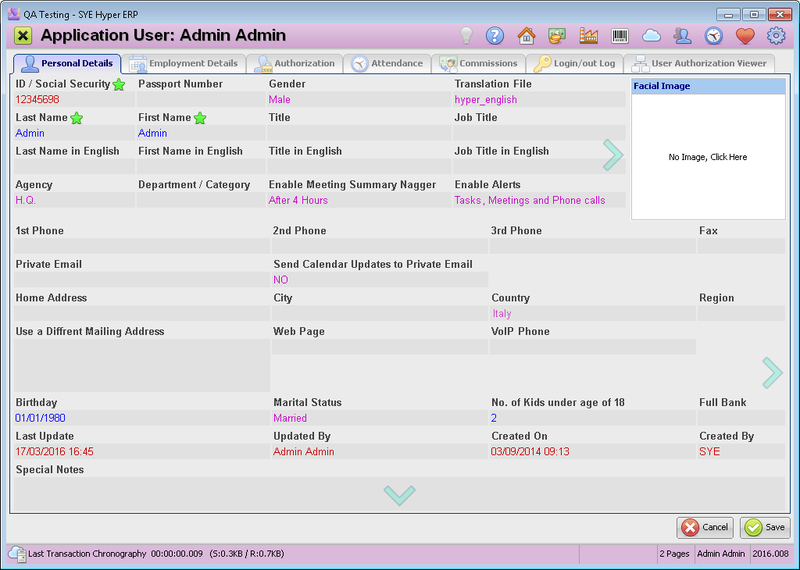 User Authorization Viewer - This tab displays the user's customized authorizations of the user. This is the primary tab of the employee's card and displays the personal details of the employee and the job definition. Translation File Select the required interface language for this user. Agency, Department / Category Select the employee's agency and department. Enable Meeting Summary Nagger In order to follow the employee's activity and for statistical needs, the employee can be forced to summarize the meetings. Select the required deadline for the employee to summarize the meetings. The alerts will be displayed for the employee, as long as the meeting is not summarized. Enable Alerts Select which required activities will alert the user. Private Email This field allows to update the private Email address of the employee. After filling in this field, the option of sending email messages directly to this private email address become available, as well as the option of sending every calendar update to it. Send Calendar Updates to Private Email This option allows the user to receive updates in the calendar, directly to the defined private email address. Load Image - Load an image from the user's personal computer. Capture Image - Capture image from selected source / device. Select Capturing Source - Select a capturing source / device. Capture Screen (Desktop)Image - This option displays the background of this window and allows the user to capture a selected frame of it, and define it as the employee's image. Clear Image - remove the image from the employee's card. Convert into Black and White. Anti-Alias - Blurs the boundaries of the image. Crop Margins - Use this tool to change the boundries of the image. The required information fields of the user card can be modified and defined be the system admin or human resources manager, according to the organization's requirements. The employees name stringing should be defined in the "Global & Basic Setting" of the System Fundamentals. Select the required string from the suggested options in the "Employee Name Stringing Field".